ETT HJÄRTLIGT GRATTIS TILL JUNIOR MED SEGERN I SVENSKA DERBYT! Just a quick update from the Swedish Derby yesterday - the Reuterskiöld Family, father Lennart with wife and 3 sons with their wife's and jockeys from the 4 stables hosted Monty Roberts' demonstration this year at Flyinge. Both father and the 3 sons are trainers in the racing industry. Monty had a nice talk with the family and they had mutual friends at Gestut Farhof. At the demonstration, Monty spoke with the Reutersköld Family to the audience and it was very much appreciated both for the racing industry, Reuterskiöld family and the audience. This years Swedish Derby was won by Lennert Reuterskiöld JR, his first derby win with Hurricane Red under Elione Chaves. 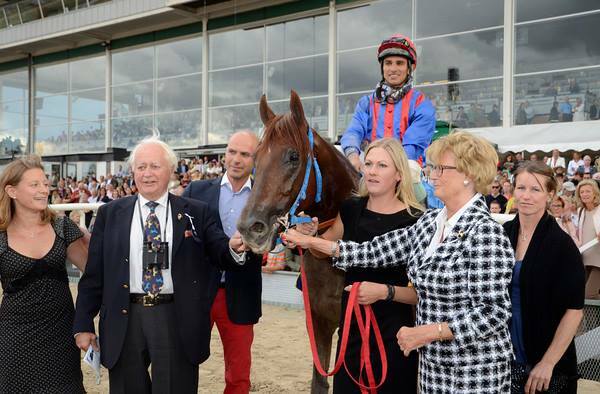 Owner of Stall Sada is Marianne and Charles Andrén, one of the oldest racing stable in sweden, Stall Sadas first Derby win was with the horse Skirner 1944.